Most of my friends and readers know that I am an advocate of online shopping if only for the ease and comfort it brings me. I like how easy I can just click cart what I want and proceed to check-out. I know not everyone is comfortable with online shopping but with the way how technology is fast changing our lives, we won't really have a choice but to adapt and go with the trends of the time. I am also a fan of designer stuff but I don't splurge just as much, only when I really really want something (even if costs a full months salary or higher) then I would save up for it and give up anything I am spending with a drop of a hat. I love handbags and shoes among other things. So knowing that Reebonz (private sales, with exclusive members only deals) has finally come to the Philippine online shopping I just said a hearty hallelujah. Apparels, handbags, accessories and shoes will be available to us online buyers. Reebonz City is going to be your gateway to the best and most exclusive lifestyle experiences. The team of Reebonz City curators seeks out coveted services, extraordinary events and luxury vacation deals and negotiates incredible offers for its members. Reebonz City acts as a bridge between consumers and a tightly-edited selection of noteworthy deals from the city over, and beyond. Membership is free as long as you know somebody that is already a current member. Only members have access to events held on Reebonz. 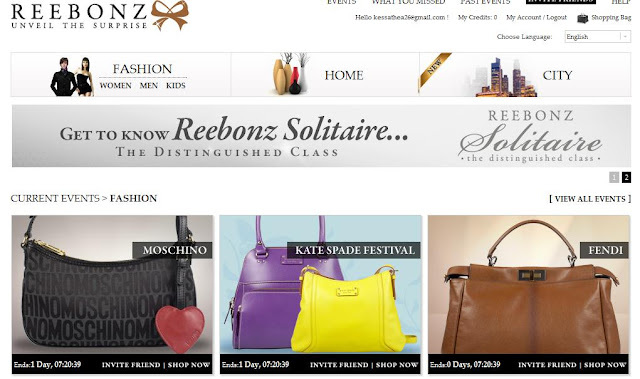 Events held on Reebonz are for members only and last typically between 2 to 3 days. Each event is held only for the stated period in the deal - once ended, it is gone for good and if you did not take advantage then you're left to pray for another deal as good as the previous one. Invite your best friends and only those you want in the Reebonz community. You decide who gets access to Reebonz. Invite a friend and get 10 credits when your friend joins and makes his/her first purchase. Balenciaga, Burberry, Chanel, Coach, Dior, Fendi, Gucci, Kenneth Cole, Miu Miu, Prada and Tod’s are just a few of the other brands included in Reebonz's roster. Reebonz currently accept all BDO Credit Cards, Amex and the BDO Virtual Cards and bank account deposits as form of payments. You also have to make sure to subscribe for the newsletter so you can be alerted of Pop Up Sales. For a limited time, BDO, American Express, and Virtual Card members can get an additional 5% off Reebonz purchases. Now, this is going to be very difficult to resist but the again at the end of the day, every one deserves to treat themselves on some must-haves. Entrance to Reebonz is by Invitation Only. And here's an INVITE just for you. If you have any questions or any concerns, check the Reebonz FAQ. You can also call Reebonz Philippines Hotline at (632)8938561 Monday to Friday, 9AM-6PM (GMT +8). Reebonz' office is at Suite 1201, 12/F Corporate Center, 139 Valero Street, Salcedo Village 1227 Makati City.